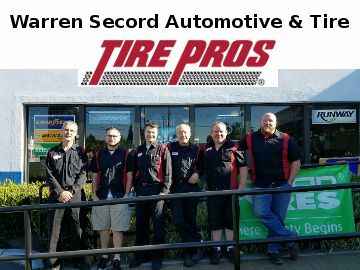 The success of Warren Secord Automotive & Tire is attributed to our talented employees and their commitment to Your satisfaction. Our staff possess an impressive list of certifications, training and experience. All of our shop technicians are certified as well as some whom are ASE Master Certified Auto Repair Technicians and Washington State emission certified. They hold a wide variety of qualifications and over 100 years of combined experience! We work hard to be your professional Auto Service and Tire Store in Kent, WA. "[My company has] been [going to] Bill and his crew for years. They take care of our company trucks and many personal vehicles. I honestly have nothing but good things to say about this crew. It's nice to be able to have a shop you can trust. I send friends and family here with zero hesitation. Keep up the good work guys!" Started with Warren Secord Automotive in 1998. Worked as Auto Repair Technician and Service Advisor for 10 years before buying business in 2007. Born and raised in the Seattle area and have never left. I started working on lawn mowers when I was 12 and the next thing I knew, everyone wanted me to fix theirs. It was then that I knew if it had an engine on, or in it, I could probably make it run again. Next came cars. I started working at a neighborhood service station when I was 16, pumping gas when full serve was really full serve. I never dreamed I would own my own shop someday. 5+ years in the automotive, tire, and service industry. Good with people, understanding, very knowledgeable about tires and wheels. Many hours of tire and custom wheel training. Keenan likes to race cars, built and raced his Mitsubishi EVO 8, is an avid softball player and enthusiast. Lee is definitely a people person, an excellent communicator, and very good at what he does. Lee likes his hot rod and Jeep, he is an avid 4 wheel drive enthusiast, playing off road whenever he can, likes camping, and spending time with his family, friends and dog. Stu is an extremely talented electrical diagnostic technician, he can find that broken wire or bad connection when no one else can. And he doesn't give up until the problem is solved. He is always willing to share his knowledge with all of the other technicians in the shop, he wants every one to be better. Stu likes to spend time with his family, friends, and dog. He also likes to cook, garden, and go antiquing with his wife. Stu is an active city counsel member in his home town, he is trying to make a difference in his community. Has been with Warren Secord Automotive since 1991. Special Skills: Suspension repair, brake repair, wheel alignment, custom wheel selection and mounting. Exceptionally clean and careful worker with high level of attention to detail. Race tire technician for the Nascar NW series, SCCA races, and Vintage Car races for many years. Florin enjoys spending time with his wife and kids, camping, hiking, church, PTA, and volunteering as a Watch Dog at his children's school. He is a very generous person. Started with Warren Secord Automotive in 2010. Auto Repair Technician for over 20 years. John realized at a young age that auto repair was his calling and it has been full throttle to repair or service almost anything with an engine ever since. He took auto shop in high school and started working with his father who taught him the basics of automotive repair. Today John has a special interest in vehicle performance modifications. He is always up for any new challenge with lots of attention to detail. John finds the rapid change in automotive technology interesting and attends training whenever it is offered. Outside of work John likes to spend time with his wife, his hot rod, and RC car hobby. I am very well pleased with the service and the attitude of the employees at Warren Second Automotive. They were very helpful in explaining to me any issues that may need to be handle at a later date, and are willing to work with my schedule for normal services that I may require. I appreciate the friendly and straight forward service provided by the team at Warren Secord automotive. I always feel I am getting accurate and honest recommendations and information regarding needed service in a timely manner. Thanks! As always when I bring my car in for service I know that these guys are going to take care of me and try to get necessary work done in least amount of time without any undue inconvenience. They never fail! Their follow up calls with any work required are timely and 9 times out of 10 they can get it done the same day. Their customer service is on point and their technicians are very knowledgeable and experienced. I have been coming here for at least 8 years now and would not trust anyone else!